The Mission of the JCAHO is to continuously improve the safety and quality of care provided to the public through the provision of health care accreditation and related services that support performance improvement in health care organizations. 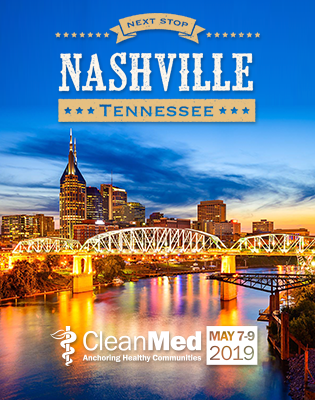 The mission of Hospitals for a Healthy Environment is to provide education, tools and information about best environmental practices to help health care professionals improve operational efficiency, increase compliance, and improve the health of their communities. So there's so overlap here! This teleconference 'crosswalk' will help to integrate H2E Pollution Prevention and Waste Management activities into the JCAHO process. A facility's long term commitment to health, communities, employees and the environment can be folded very nicely into the existing JCAHO structure. Performance Improvement initiatives can be within the Environment of Care's Hazardous Material and Waste Management Plan, within Patient Safety, Employee Safety or Quality Improvement - it can fall in so many places because a commitment to health touches upon all these areas. The structure of H2E - gathering data, setting goals, developing a program, tracking progress, reporting - are in line with the structure of goal setting and performance tracking for the JCAHO process. Kill two birds with one stone! Integrate your facility or organization's environmental goal into the JCAHO structure. Sample performance indicators include - tracking and reducing number of mercury spills, transitioning to glutaraldehyde-free high level disinfectants, transitioning to less toxic floor strippers, integrating environmental criteria into building materials, transitioning to mercury free medical and facility devices, increased recycling rates, tracking waste data and more! Laura Brannen is the Executive Director of H2E. Laura has been working in health care for 20 years in a variety of jobs related to environmental management, including serving as the Assistant Director of Environmental Services at Massachusetts General Hospital and environmental programs coordinator at Dartmouth-Hitchcock Medical Center in New Hampshire. Laura joined H2E in 2001 as the full-time Director and is motivated by the tremendous opportunity within the health care sector to reduce our collective environmental footprint. Like many working on environmental programs in healthcare, Laura has been advocating for created synergies to enhance environmental compliance and pollution prevention programs with the JCAHO Environment of Care Standards. Laura and her husband, Barney, have two teenage girls, Grayson and Conner, and are avid mountain bikers and hikers. And when not doing those things or working at all hours, you can find Laura in the garden in Lyme, NH.